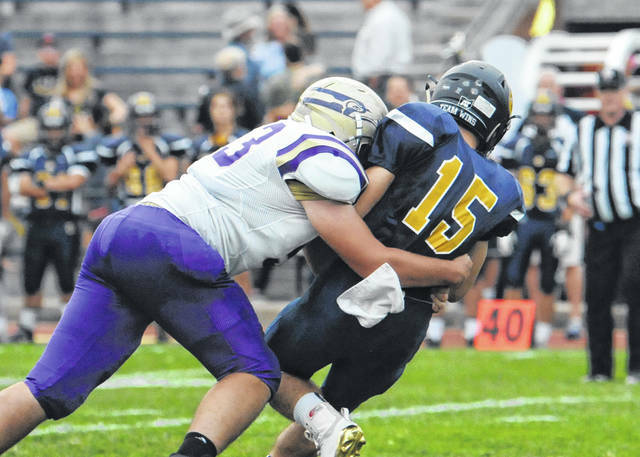 Eaton’s defensive line contained Oakwood for much of the first half during an SWBL game on Friday, Sept. 21. The Eagles gave up 20 points in a 12-minute span covering the third and fourth quarters and never recovered in a 40-12 setback. 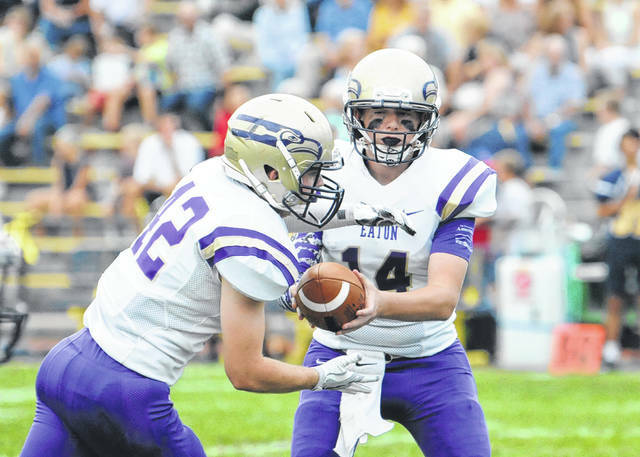 Eaton quarterback Dawson Blaylock passed for a 166 yards in the Eagles 40-12 loss at Oakwood on Friday, Sept. 21. DAYTON — Just when Brad Davis thinks the message he and his coaching staff have been delivering to the Eaton football team has sunk in, some things still don’t seem to be registering. 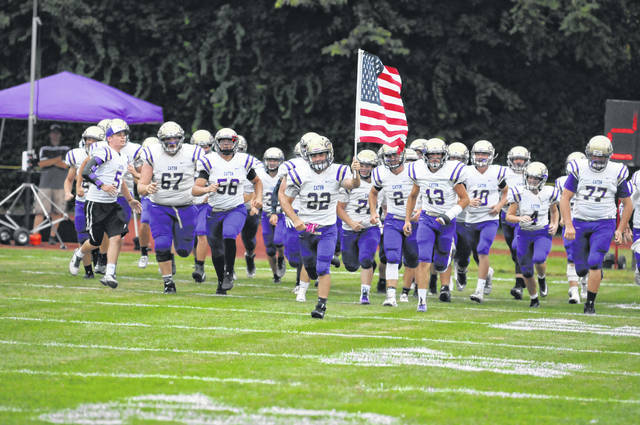 That was the case Friday, Sept. 21, at Mack Hummon Field, as the Eagles dropped their fifth straight game, 40-12, to Oakwood. The Eagles were playing well until midway through the third quarter — trailing 20-12 with just under 8 minutes left in the quarter — before the things started to got out of hand. “I think what we are going to find when we watch the film is it’s going to be blocking, it’s going to be tackling and it’s going to be turnovers. Those are going to be the three big ones,” Davis said. After Eaton cut the Lumberjacks lead to 20-12 on a 35-yard TD run by Zac Schmidt with 7:56 to play in the third, Oakwood recorded three scores in less than 12 minutes to take command of the game. The Lumberjacks went up 26-12 with 6:27 left in the third. 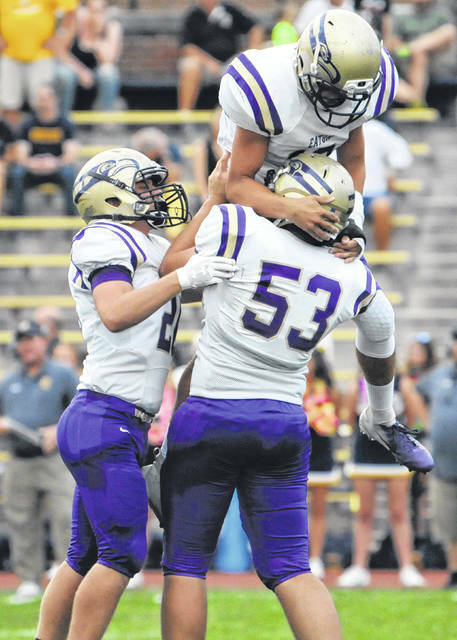 They added another score with 9:57 to play in the game and capped off the scoring returning an interception 57 yards for another touchdown with 7:50 remaining in the game. Eaton had a chance to take the lead in the first quarter but 32-yard field goal attempt came up short. Moments later, the ‘Jacks Jake Sargent broke several tackles and raced 80 yards for the game’s first touchdown. The point after try failed leaving the ‘Jacks with a 6-0 lead with 48.4 seconds left in the first quarter. Oakwood made it 14-0 on a 25-yard run and two-point conversion with 1:53 left in the half. Eaton’s offense responded with a 62-yard drive. Schmidt caught a 20-yard TD pass from quarterback Dawson Blaylock with 36.4 seconds left in the half. But that was plenty of time for Oakwood to respond. The ‘Jacks scored on a 30-yard TD pass with 1.6 seconds left in the half to take a 20-6 lead. “Defensively, I really like the way we played in the first half minus about three plays,” Davis said. The Eagles also turned the ball over twice inside the Oakwood 20, which negated scoring opportunities. 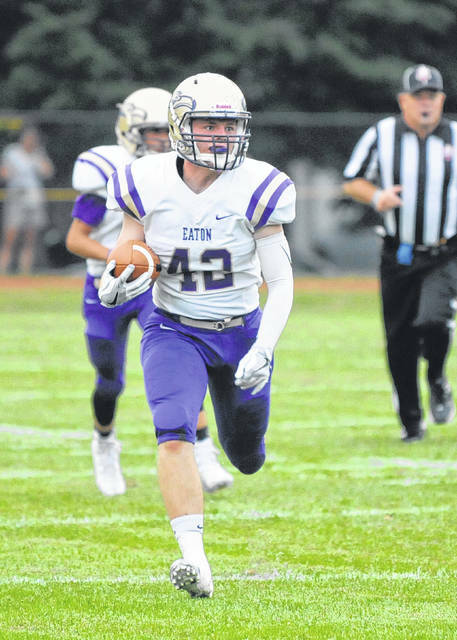 Caleb Puckett led the Eagles with 100 yards rushing on 21 attempts. Blaylock completed 15-of-29 passes for 166 yards. Schmidt caught five passes for 84 yards and Chris Weadick had four catches for 38 yards. 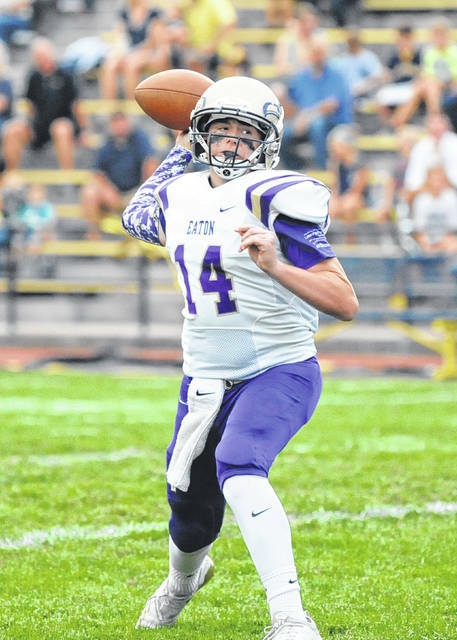 Eaton, now 0-5 overall and 0-2 in the Southwestern Buckeye League’s Southwestern Division, is scheduled to travel to Monroe (0-5, 0-2) on Friday, Sept. 28.
https://www.registerherald.com/wp-content/uploads/sites/41/2018/09/web1_ehsfb3.jpgEaton’s defensive line contained Oakwood for much of the first half during an SWBL game on Friday, Sept. 21. The Eagles gave up 20 points in a 12-minute span covering the third and fourth quarters and never recovered in a 40-12 setback. 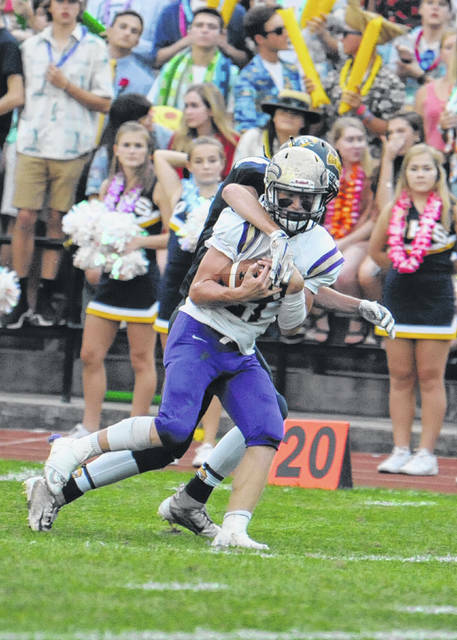 https://www.registerherald.com/wp-content/uploads/sites/41/2018/09/web1_ehsfb4.jpgEaton quarterback Dawson Blaylock passed for a 166 yards in the Eagles 40-12 loss at Oakwood on Friday, Sept. 21.